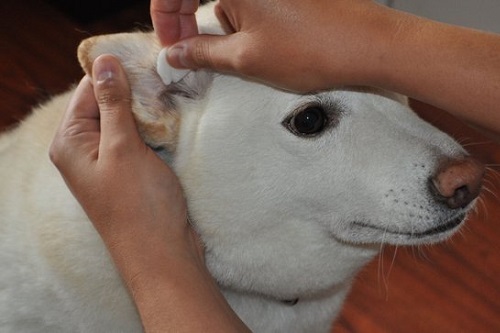 Cleaning your furry pal’s ears becomes easier if you have a handy ear cleaner at hand. As a responsible pet owner, you are responsible for monitoring your dog’s ears for any signs of infections, wax or any other kind of debris. This will keep your pet’s ears in check, reducing the risks of all kinds of infections and diseases. Why Invest In An Ear Cleaner? An ear cleaner is an indispensable tool that plays an effective role in maintaining your dog’s hygiene. Pet owners must understand that the ear is a highly sensitive organ that requires special care and attention. Fortunately, ear cleaning becomes much easier if you have the right ear cleaning solution at hand. Ear cleaners effectively help pet owners remove dirt, debris or any wax without causing pain to your beloved pet. Allergies: Allergic reactions are possibly the most common types of ear problems today. Allergies are often caused by environmental irritants, f﻿﻿ood ingredients, or other external irritants, such as pollen and dust. I﻿﻿﻿﻿nflam﻿﻿ed paws﻿﻿﻿﻿ and ears are common symptoms of an allergy. Consider switching your furry friend to a low-allergen diet that does not contain ingredients, such as corn, soy, and wheat. Keeping the environment as clean and dust-free as possible is also an effective way of reducing the risk of allergies. 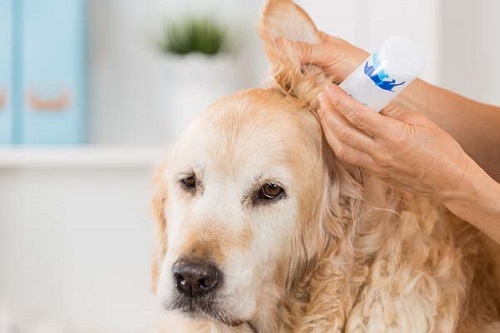 Parasites: Excessive itching and ear pain associated with parasites may be a sign of mites, f﻿﻿lea﻿﻿s and tick bites. Consider taking your dog to the vet if the symptoms are severe. 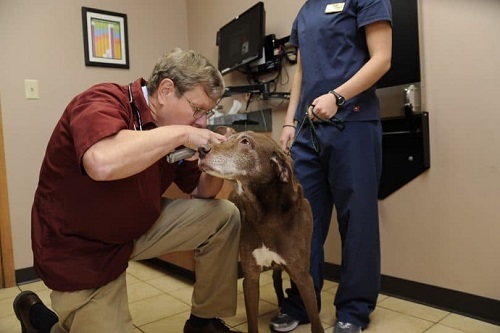 ​Ear Infections: Ear infections may be an ongoing problem if you have adopted a drop-eared dog. The fold creates a moist and warm environment that is ideal for bacterial growth. If only a single ear is infected, your dog may frequently tilt their head to equalize pressure. Trauma: An ear injury or an animal bite can also lead to serious problems. Injuries can lead to vigorous scratching or head shaking that might worsen the situation. 1. Start by straightening your dog’s ear canal by gently pulling up the tip of his earflap upwards. 2. Open a bottle of ear cleaning solution and gently drop it into your dog’s ear canal with the help of a glass or plastic dropper. 3. Use your thumb and forefinger to massage the base of your furry pal’s ears gently for about 30 seconds. You should hear a soft squishy sound. ​4. Now, tip your canine’s head to the side and allow the ear solution to drip out into a clean towel. If this is your first time, do not freak out about the drainage. ​5. Let your dog shake off the excess ear wash, so he feels more comfortable. ​6. Use a soft cloth to clean and remove excess wax and particles from your dog’s ear canal. Be sure not to insert the cloth too deep. You can also use an instrument specially designed for cleaning ears. ​7. Now that your dog’s ears are clean promote air circulation by folding back their ears, allowing them to dry for a couple of minutes. ​8. 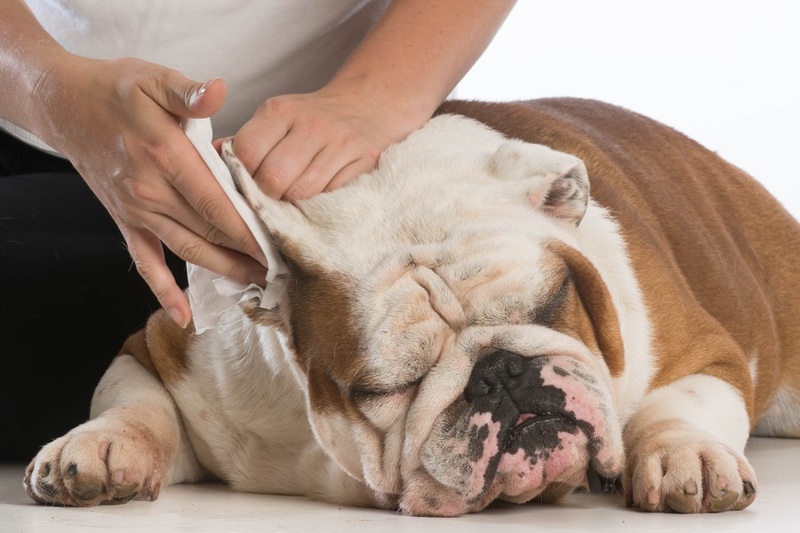 Wrap up your ear cleaning session by using dog-ear drying powder. When it comes to cleaning your dog’s ears, always be careful. If your dog has been scratching his ears excessively or simply looks uncomfortable, consider taking him to the vet instead of sticking something down his ear. While trying to clean his ear might seem like a good idea, you can aggravate the condition if you don’t know what you are doing. Before you begin scrubbing, ensure you have all the supplies you need set on the table. This includes an ear cleaning solution, towels, and cotton balls. Also, do not forget to wash your hands since you do not want to introduce bacteria and infectious particles to your canine friend’s ears. If your dog feels uncomfortable, consider asking a friend to distract him while you are examining his ear. Once you have determined your canine friend is not suffering from an infection and merely has dirty ears, start wiping off the dirt. Use a soft cotton ball dipped in oil to clean the inner surface of your dog’s ears gently. Be careful not to stick the cotton ball any further than it should go. Clean the ear thoroughly and remove any foreign particles, such as bugs or dirt. Once you are done, don’t forget to give your dog a pat on the back and possibly a tasty treat. This will teach your dog to become accustomed to the idea of regular ear cleaning. Clean your dog’s ears regularly and make it a part of your dog’s integral grooming sessio﻿n.